Youth Mental Health First Aid “Train the Trainer” events coming soon! Understanding how to administer first aid to a child experiencing a mental health crisis is critically important. Youth Mental Health First Aid “Train the Trainer” events in Raleigh and Charlotte this spring will prepare you to instruct others on the critical signs of distress and how to help. Learn more and apply now! 2018-19 Reflections winners have been announced. Thank you to all who participated. Click here to see the results, and join us for the celebration on April 6th! 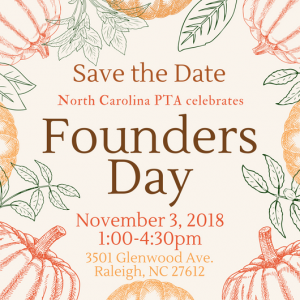 The Director of Family Engagement implements, administers, and evaluates the grant-funded programs of North Carolina PTA. The Director of Family Engagement reports to the NCPTA Executive Director. Drafts health newsletter, Facebook posts, and other health resource communications for Executive Director’s approval. Actively manages third party grant-related vendor agreements and work, including work by third party evaluators and reports progress of agreements and work to Executive Director. Ensures outcomes described in grant documents are met and work described in the grant application, grant narrative, grant budget, and grant agreement are accomplished. Monitor paperwork and necessary documentation connected with grant programs. Work with program staff to ensure an accurate, timely, efficient and transparent process for the grant life cycle. This entails tracking payments, reviewing or producing relevant reports, monitoring and post award management. Work with Program staff to develop and maintain all grant agreements pertaining to grant awards. Two year’s experience in grant administration or grant management preferred. Ability to work on a team and provide support to junior staff. Possess a thorough, organized and detail-oriented approach to work. Plan, prioritize, and coordinate, multi-task and complete work assignments within deadlines. Good understanding of the organization’s mission and strategic plan. Disclaimer: This job description does not include every duty or responsibility that a person in the role may be asked to perform. This position may be required to perform other related duties as assigned.